Charles Dickens: A Tale of Two Cities. For of all my discoveries, nearly the most breathless was Dickens, himself. How many of the educated can ever suspect the delight of such a delayed encounter? I think we owned a Collected Works when I was a child. But I had tried David Copperfield too early and had believed all my life that he was not for me. One night last winter I was sleepless and somehow without a book. From our own shelves I took down Little Dorrit, which people tell me now is one of the least beguiling of the lot. But Keats first looking on Homer could have been no more dazzled than I first poring on my Boz. I felt as a treasure-hunter might feel had he tripped over the locked chest that belonged to Captain Kidd. I found this quote in a good piece about not being able to understand the classics until we are adults by Tod Worner at Word on Fire. Phyllis McGinley, whose wonderful book Saint-Watching I have loved for some time, echoes precisely my own adult encounter with Dickens in A Tale of Two Cities. I still remember how thrilled I was to see how many of his books were there for me to discover. I went on to read all of them. 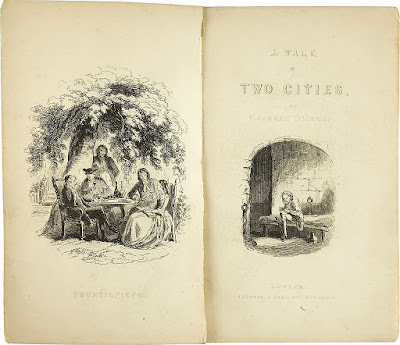 It is interesting to think about the classics that I've grown to love as an adult since Uncle Tom's Cabin awoke me to the possibility that maybe classics weren't boring. That was in 2006. From there I went to the afore-mentioned A Tale of Two Cities, The Lord of the Rings, Dante's Divine Comedy, C.S. Lewis's Space Trilogy, and Kim. All are books that I approached with the trepidation borne of early failed attempts. Some I had to approach with audio, print, and commentaries. But I kept going and there was something very worthwhile in them all. The latest in that struggle was Brideshead Revisited which my book club just discussed this Monday. I do not yet love it, but I now appreciate a book I had cast away twice earlier with distaste. I know I will reread it and can foresee a future where I might love that work. Once I was finished, I appreciated the struggle itself and the fruit it yielded. There was a real sense of satisfaction in working through a challenge successfully. What I found in each was something that enriched my life and mind in new and exciting ways. All of this is to say that when I feel a book challenge circling my mind I no longer duck and weave to avoid it. I wait to see if it will settle and then approach the book with a certain anticipation, both of the struggle and of the achievement. Next up? Well, I have been thinking about Augustine's City of God an awful lot over the past few months ... and also Crime and Punishment. We shall see if either of them settles down to roost. I hope you do give BRIDESHEAD REVISITED another try someday -- it's one of my all-time favorite books!